Whether in the parade or afterward, at the big game, some high-school girl or coed strutted her stuff in this set. Sorry that I don’t know what school it was associated with, but she must have kept her letters as memorabilia. Styling and construction put it in the Sixties or Seventies. Again, a super-seasonal find which makes it all the more fun. Won’t be a keeper in the long run, but we were approaching Halloween when this turned up. I’ve got lots of “new” things which could make dynamite costumes . . . . . . . . . . . . . . . . . . . . . . . .
An iconic Mod flower-power print, with sheer sleeves at the same time! The dress material is a loosely-woven stuff that they used to call “hop sacking” in the mid-Sixties (but, of course, not real hop sacking, which is a different thing – sort of like the sugar and flour bag material that women used to make shirts and dresses from on the farms WAY long ago). It fits Stella in a way that’s too short and tight to look the way it is supposed to, and would do better on a model a little bit smaller and not quite so tall. But, anyway, oh so cute and DEFINITELY from about 1966. 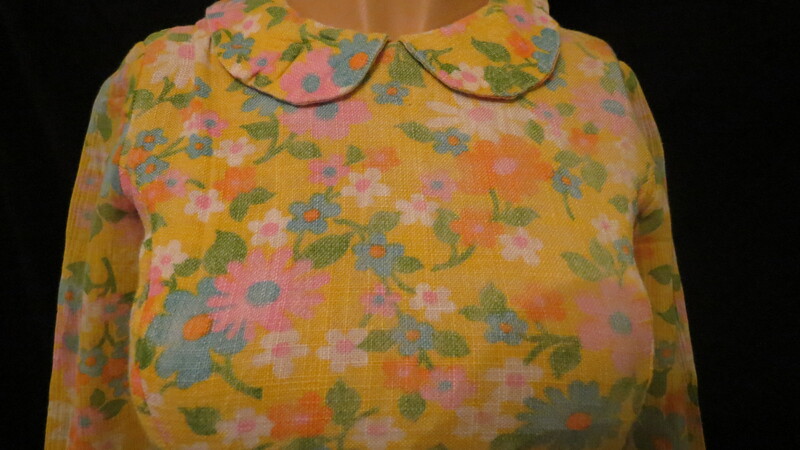 Notice the Peter Pan collar. CUTE LITTLE SEERSUCKER MINI SKIRT SUIT FROM THE MID-SIXTIES, FOR SPRING, SUMMER AND EARLY FALL! A cotton suit like this is a very unusual discovery. Casual wear often didn’t stay in good shape over the years and separates, especially, didn’t stand the wear and tear of frequent use. It’s not rare to run into seersucker, which is a really fun and durable fabric. But, to find a true vintage piece is quite uncommon. Like in the Fifties, it seems that little casual suits were also popular in the Sixties and were worn like day-dresses used to be. Pants were STILL not hugely popular, with women generally sticking to dresses and skirts more often than we do now. This outfit has cute little details like waist tabs and notches in the hems – nice tailoring details that are a hold-over from the 1940’s and 1950’s, though I think this suit was sold through one of the catalog houses that were popular then, like Montgomery Ward, Penneys or Sears & Roebuck, and wouldn’t have been considered a high quality item. Not quite my color and a little large for me, so it probably won’t stay in my closet forever. But, can’t pass up a beauty like this! Such fun . .. . . . . . . . . . . . . . . . . . ..
No rain in the forecast, but the Magicvintagespy is getting DRENCHED! The unique true vintage finds keep on coming. This cute culotte is not as MOD as the yellow print one I found last week, but it’s also got a metal zipper – this time center back – and an interesting front design. Unfortunately, the maker’s label and other tags are gone. Don’t think it was custom-made. Nothing could be more convenient than this style for ease of wearing, sports and versatility when shorts aren’t the thing but a skirt or dress is just too much. A real blast from the past .. . . . . . . . . . . . . . . . . . . . The Bobbie Brooks company has been a fabulous maker of classic sportswear for many decades and their true vintage items are very special – well-designed and made to a high standard. I always do a flip when I find one! This “skort” is summer-perfect – dressier than shorts, easier than a mini-skirt (no ugly and ungainly exposures and attempts to avoid them), cool and FUN. 100% cotton!! 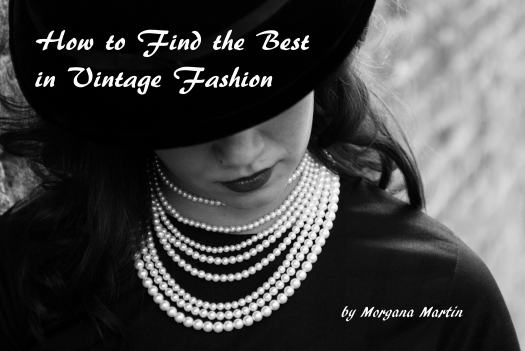 I love and discover all types and makes of true vintage fashion, but a high-quality brand name is always an extra plus. Love this one! It’s an easy-wear knit in one of the fun styles that were so popular in the mid-1960’s. Beatlemania and all of that!